1940s Pine Plate Rack with Shelf Top to Wall Hang or Free Stand. 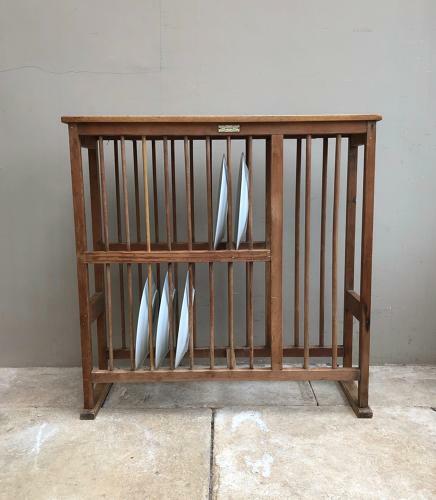 A great condition & size 1940s "Maxwood" Pine Plate Rack. Two tiers to the left and meat plates to the right. Nine sections in each tier to hold 18 plates in total. This plate rack easily holds modern size dinner plates (shown in photographs) many antique plate racks dont as plates were smaller then. There are hooks to wall hang and it has been on a wall previously but perfectly ok to freestand on a worktop etc. A top has been added which means there is a very handy shelf to the top too. Collection or Courier UK £45.